You want to gain 30 pounds of muscle in your first year of training? If you’re skinny-fat, forget about it! When I started training, I thought I would gain 20-30 pounds of muscle in my first year of training without adding any body fat. That’s at least the idea I got from reading countless bodybuilding forums, transformation success stories and eBooks. Because of that, I decided to train hard and gain as much muscle mass as possible in my first year of training. I added hundreds of pounds to my compound lifts and I changed from a diet full of empty calories to a healthy diet full of whole foods. Unfortunately, I ended up disappointed. Instead of filling out my skinny-fat frame with muscle, I gained 35 pounds of bodyweight and ended up fat. A realistic guess is that I gained 8 pounds of muscle and 27 pounds of fat. I don’t want you to go through the same pain as me. Instead, I want you to start your skinny-fat transformation with somewhat realistic expectations in mind. By knowing how fast you can gain muscle, you’ll start to appreciate any progress you make in your training, rather than looking for a quick-fix all the time. Therefore, the goal of this article is to answer the question: How much muscle can you gain in 1 year? If you sum up he potential muscle gains for the first 3 years of training, you get a total of 35-43 pounds. 35-43 pounds of muscle gains in the first 3 years of training don’t sound too bad, however it’s important to note that the model assumes average genetics. Unfortunately, skinny-fat guys have below average genetics. (Muscle gains are hard to come by while fat gains seem to accumulate just by looking at food). Because of that, most skinny-fat guys will gain less muscle mass than this range suggests. In the sections below I will explain why, by relating to my own training history and the countless skinny-fat stories I have received in my email inbox. Keep in mind that the numbers I provide below are ESTIMATES. People gain muscle at different rates, but those estimates should at least give you an idea of what’s possible. The typical skinny-fat guy has 20-30 pounds of fat to lose. If we assume that you have 24 pounds to lose, and you lose 6 pounds per month, you will be doing fat loss for the first 4 months of you training. That leaves 8 months to gain muscle while staying lean. This is different from the average guy which the McDonald Model is based on. The average guy is either muscular-fat (endomorph) or skinny-lean (ectomorph). The endomorph will gain a lot of muscle mass and fat during his short bulks, then spend a long time cutting. The ectomorph will gain a small amount of muscle mass, but he will be able to bulk for a VERY long time, since he doesn’t gain much fat. What about the skinny-fat guy? Just like the ectomorph, he will gain a small amount of muscle mass, but just like the endomorph, he will also gain quite a lot of fat. If he wants to remain aesthetic, he needs to spend a significant amount of his year controlling his body-fat level. In other words, the skinny-fat guy cannot expect to gain as much muscle mass as the average guy in his first year of training. I estimate that a skinny-fat guy can gain about 15 pounds of muscle in his first year of training. Unfortunately, those 15 pounds of muscle mass will not be enough to make you look muscular. Instead, you will end up looking skinny. The reason for this is that most skinny-fat guys carry close to ZERO muscle mass when they start, so the first 15 pounds will make you go from “skeleton” to “lean”. This is a 2 year transformation picture of a Skinny-Fat Transformation reader who spent a long time following bad advice. 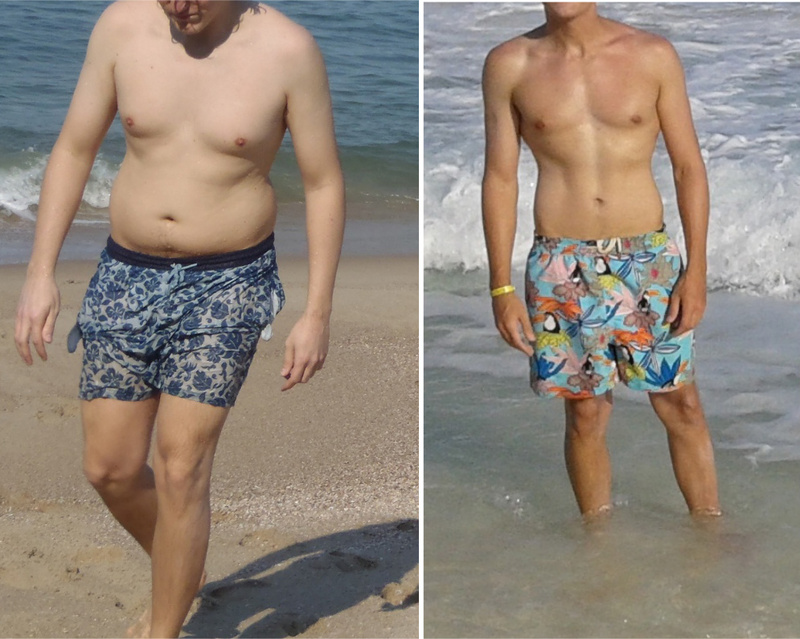 As a skinny fat guy, I have been struggling for a long time to improve my appearance with a lot of effort and poor results, following the same bad advices as you in your beginings. It’s been 7 weeks since I started applying your ideas and so far I’ve had the best progress in my life after years of intermittent weight training. I really appreciate having found your website and I want to thank you for sharing all your experiences! After finding Skinny-Fat Transformation he went from 0 to 8 chin ups and lost 12 pounds of fat in just 7 weeks. That was a month ago. Now he is up to 11 chin ups. The progress he made from picture 1 to picture 2 is the kind of progress a skinny-fat guy can except in 1 year of proper training and eating. I see the first year of training as “preparation” to make the most out of your second year of training. The lifestyle changes you make in your first year of training combined with fat loss, will place you in a great position to gain muscle while staying lean in your 2nd year of training. It’s not a joke when people tell you to change your lifestyle if you want to change your body. When I lost 60 pounds of fat, started eating more dietary fat from whole foods, sleep better and train hard, my testosterone levels increased by over 100%. Good testosterone levels are key to benefit from resistance training. Without sufficient testosterone, hard training will make you fatigued and fat. This is why you want to do a minimalistic strength training and lose fat in your first year of training. By doing those two things, you will lose the chub, optimise your hormones and build foundational strength. Those things are crucial, if you want to benefit from training like a bodybuilder and eating a caloric surplus. As explained in my previous article about getting muscular with calisthenics: the real muscle gains come when you start performing the exercises with slow, controlled movements while eating enough to support muscle gains. Because of that, I estimate that you will gain 8-12 pounds of muscle in your second year of training. 1: In your 1st year of training you should already have gained a base-line of muscle all over your body, so any additional muscle mass will make you look bigger than the average guy. 2: The amount of muscle mass you can gain is limited by your genetics, however you can partly decide WHERE you gain it. By training like a bodybuilder you can emphasise your weak muscle groups and make those 8-12 pounds count. In other words, the second year of training may not result in bigger muscle gains than the first year of training, but the muscle you gain will look impressive – especially if you focus on the areas of your body that you want to grow. Unfortunately, I don’t have a good picture from my 2nd year of training to show a good example of this since I didn’t train like a bodybuilder until my 3rd year of training, however I have one from my 3rd year of training. The picture below shows the progress I made in the first 6 months of training like a bodybuilder, where I emphasised my arms, shoulders, upper chest and lats. I gained around 13 pounds in those 6 months, and I believe that’s the type of progress you can except in your 2nd year of training if you do things right. In the third year, you can except to gain around 5-6 pounds as predicted by the McDonald Model. Just like in the second year, you should focus on the areas of your body that you want to grow, and make the most out of those 5-6 pounds. In other words, you should add around 28-33 pounds of muscle in your first 3 years of proper training and eating. After the 3rd year of training muscle gains are slow and inconsistent. They usually come in chunks of 2-4 weeks, followed by 5-6 months where you don’t see any noticeable changes in your physique. At this point, your body has gained the majority of the muscle it is capable of carrying. I have tried all kinds of things to speed up muscle gains, such as training hard 4-6 times a week, sleeping 10 hours a day and eating a lot of healthy calories. This works, and I look 10-20 pounds bigger when I do it, despite gaining just 5 or so pounds. However, once I decide to cut the excess fat, I can’t train as hard as I do during my short bulks. Therefore, I lose some (but not all) of the size I gained. To progress beyond this point you really have to love training and be patient. My advice or people that have trained consistently for +3 years is: learn how to cut fat while minimising muscle loss. Provided that you’re fairly lean, you can actually cut an additional 5-10 pounds of body-fat and end up looking much bigger despite gaining no size. With that said, I’m not saying you CAN’T gain muscle after your 3rd year of training. I’m just saying that gains are so slow that it doesn’t pay off to obsess about small details. Instead, you should look at the big picture and make sure that you do your workouts every single week no matter how slow your progress is. There’s no way your body will be the same if you train like a bodybuilder, have periods of caloric surplus while consistently pushing your limits. I have always been hesitant about writing this article, since it may tell you things you don’t want to hear. Nobody wants to hear that they can “only” gain 28-33 pounds of muscle in 3 years of training. People want to gain that in ONE year. Not THREE. However, I wish that someone had told me about this when I started training. When you know how hard muscle gains are to come by, you also realise how important it is to get lean and most importantly: STAY lean. Most skinny-fat guys are at least 20 pounds overweight when they start. Even if you gain 20 pounds of muscle, and “just” 15 pounds of fat, you won’t look aesthetic, since you will have wide hips, manboobs and a soft waist. Furthermore, muscle loss is inevitable when you cut as a skinny-fat guy, so you don’t want to start your training career with an ineffective 30 pound bulk, followed by losing most of the muscle you gained. If you get lean and stay lean, you will never have to cut more than 10 pounds, thus minimising muscle loss and feeling good during the process! It will take time and a lot of effort to build a great physique when you have crappy genetics, but it can be done. If you really want it, you will put in the time and do it right. Never quit and gains will come! Really great article. I like the way you write it. Here is enough material and good photos. Tell me please, whether it is your own training program? Well to be honest I didn’t really read the whole thing. But I myself have been working out for over a year and started at 158 though most of it was spent dirty bulking eleven months to be precise but when I leaned out I gained 25 pounds of muscle though the journey wasn’t as easy as I thought it would be I kept pushing. Because at my worst I was 207 pounds and I was being poked fun of for being fat and once I cutted I was 187pounds lean with the abs and everything and everyone who called my fat just had to eat their words and live with the fact that I now have a better physique than them. The moral of the story is that it doesn’t matter how you look now, just be persistent on your goal and don’t let anyones opinion of you determine who you are as a person. you are very right, youtube is full of 4 months, 6 months, 1 year epic (!) transformations but most of them are lie if you are not genetically gifted or using steroids. I was in a similar situation. 5 years ago, I was 5’9” and 105 lbs, about 8% bf. 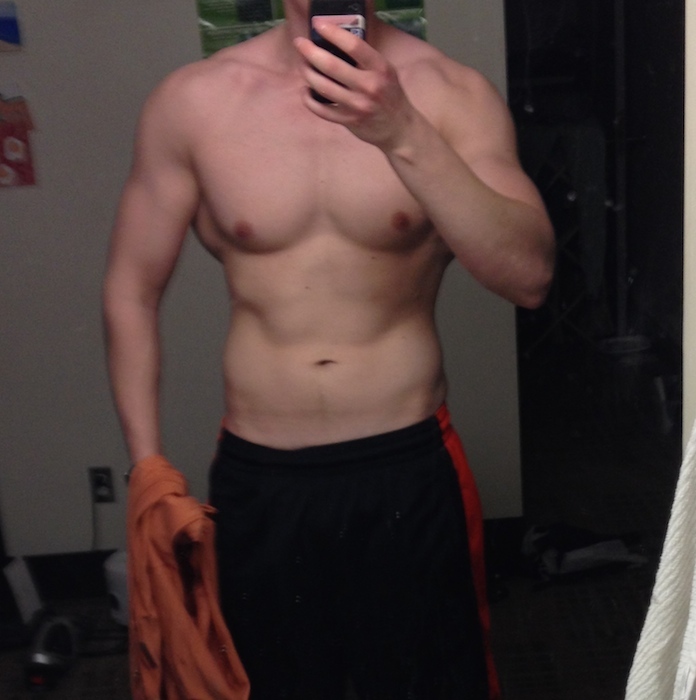 Now about 180 lbs, 18% bf. Only 10 months of those 5 years was working out though, the rest was just mass eating of fatty foods before bed every night, maybe working out once a week at best. For me what I did was eat enough so I got to a baseline of 150 lbs first. I personally found muscle gains MUCH easier at a higher body weight, because as soon as my metabolism slowed down, it became much easier to gain muscle; before hand, it was just way too fast. I could eat 2 pizzas in 1 meal and feel hungry 2 hours later. Do you have any statistics for the above average guy? When I first began training, I was 140 pounds at 8% bodyfat. in 5 months I managed to put on 30 pounds and ended up at 7% bodyfat. I have had some setbacks due to horse falling related injuries, so I have lost a significant amount of weight in the past year. The doctor said it won’t be long before I should be fine to get back at it. Will I gain this weight back quickly? Unfortunately, I don’t, but if you’re above average which it sounds like you are, my suggestion is that you enjoy the gains as much as possible, and see how far you can take your physique. It’s extremely rewarding to progress in training/sports, and I can imagine that it’s even more rewarding when you have great genetics and see results faster. I suggest you regain the weight by doing the same thing you did to gain it in the first place. You will regain it faster because of “muscle memory”. Once you’ve carried some muscle, it’s much easier to build it back up. Thank you. I’ve been at it for over 4 years and doubt I’ve gained 40 pounds of muscle yet. From today i am going to stop procrastinating and start working out.i will do pushups and pullups everyday.no need to workout legs because i go to school on bicycle 10 kms.my objective 100 continuous pushup nd 20 continuous pullup.any suggestions? Hi…im a teen from india.im 18 years old.5 feet 10 inch height,67 kg weight,37 inch chest,31 inch waist..i think i have 14% bf.not sure.i havnt measured..and also i think im ecto because i have small frame.my wrists are only 6.5 inches. Staying lean is essential. A bodybuilder should look good year round not just on competition days. Although I’m not a bodybuilder, I agree 100%. I know that the lightning is different and probably my back look defined in my first picture, but do you think that my back has become bigger/wider? It’s very hard to tell from those pictures since they are in different set-ups and just 2 weeks apart. Did you track your shoulder measurement? That would be a much better indicator for 2 weeks of progress. Pictures are generally useful to see long-term progress, while measurements are much better for short-term progress. If I was starting out all over again, I’d just pick 2 or 3 exercises and I’d train them as much as possible–like every day, with medium to moderate intensity and once, or maybe twice per week, balls to the walls. I tried this approach myself with my brother and the results were nothing but amazing. Maybe I should write a case study. Thanks and great advice Dejan. This is what I would do too. Start with 3 bodyweight exercises (squat, push up and chin up), then work my way up on those. It’s so simple, yet so efficient for a skinny-fat guy with no basic strength. Definitely write a case study, I would read it. Was he a beginner? Yeah, he was a complete beginner. He focused on just a handful of exercises and he went on to dominate them. He caught up my bench press in less than 16 weeks. He benched almost every day for 10+ sets, reverse pyramid style. Wow, what is his bench press at now? I would be very interested in reading about that. Another great article Oskar. You have so much knowledge, it’s actually crazy! You’re a walking encyclopaedia! I am looking leaner and leaner following your advice with diet and bodyweight training, that hopefully I will look “normal” while on the beach this summer. Thanks for the compliments Joseph! I’m glad the advice works for you, and I look forward to follow your transformation. Thanks for what you do. Everything you have described in your articles about your early training has matched my experiences. We even did the same programs. Even though (or maybe especially because of) what you teach flies in the face of conventional wisdom, I am going to give it an honest try. Conventional wisdom hasn’t worked for me. I’ve always thought that gaining 25 pounds of muscle would be ideal for me, so this article was encouraging. I can understand your hesitancy, but I think people will surprise you. I think more will appreciate this than not. Most of the folks reading your website have had a dose of reality and understand the difficulties of gaining muscle. My experience is almost the same as you and Oskar’s but with a twist : I started out eating slightly below maintenance calories while doing mainly 5×5 or reverse pyramid training style workouts.In the begining it was ok. Fast forward two years later and I havent lost a lot of weight ( I admit I was constantly changing between short bulking and cutting 2-4 week cycles,so I wasnt consistent with my goal of weightloss) I havent gained a lot of muscle and I am shouldering through workout after workout,3 times a week like a machine, but with my lifts stalling all the time. Instead of turning from skinnyfat to fat but strong like Oskar I went from totally weak skinnyfat to a mildly more aesthetic skinnyfat that is just a tiny bit stronger than the average guy. The lesson is ,for me,to be decisive about my goals. Might seem selfish, but I am really happy I am not alone in this suffering. When I was in a similar situation to you (2 years into training) I decided to switch my training and eating up and do the opposite of what I had done. Perhaps you should try that? A dose of reality can be good sometimes so you know when you’re doing well. Thanks you so much for your article. Since I have started following the advices of your website your articles have become like a trainning guide, so every new article is a next step of my trainning. Thanks you so much Oskar!